The balance sheet presents a financial snapshot of what the company owns and owes at a single point in time, typically at the end of each quarter. It’s essentially a net worth statement for a company. 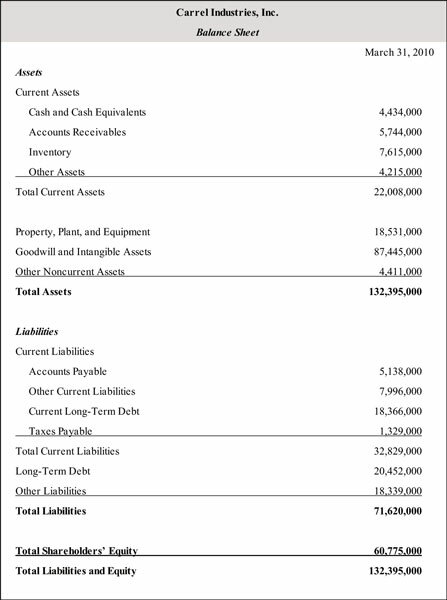 The left or top side of the balance sheet lists everything the company owns: its assets, also known as debits. The right or lower side lists the claims against the company, called liabilities or credits, and shareholder equity. Liabilities may not seem like credits to you, but that’s not a typo. In accounting lingo, a credit is a loan. A credit brings cash in that the firm can use to purchase an asset. However, this credit is a liability, a debt that must be paid back at a later date. We use assets and liabilities as our main terms, so don’t worry too much about keeping the debits and credits straight. It’s called a balance sheet because each side must equal the other. Assets equal liabilities plus shareholder equity. In other words, whatever assets aren’t being used to pay off the liabilities belong to the shareholders. See “Shareholder equity” below for more information. Assets are items of value that the company owns. The major components that make up the asset side of the balance sheet include current assets, fixed assets, investments, and intangibles. Current assets include cash and cash equivalents (bank accounts, marketable securities), accounts receivables and inventory. Other assets include investments, like stocks and bonds, and fixed assets, like real estate and vehicles. Copyrights, trademarks, licenses, patents and the company’s goodwill (standing in the community) count as assets, too, and they’re called intangibles. Liabilities are sort of like IOUs — together, they represent the total cash value of what the company owes to other entities. Liabilities aren’t necessarily a bad thing. After all, companies have to spend money to make money. They only become a problem when a company is consistently spending more than it’s earning and has no clear and viable strategy to reduce that trend. Liabilities include current liabilities, like accounts payable, and long-term debt, like mortgages. Anything the company owes falls under liabilities. Subtract total liabilities from total assets, and you end up with the company’s net worth, also known as shareholder equity — the shareholders’ ownership stake after all the debts are paid. (That’s why stocks are also called equities.) Common stock, preferred stock, and retained earnings comprise the three major parts of shareholder equity. They ultimately determine how much each share receives in dividends.